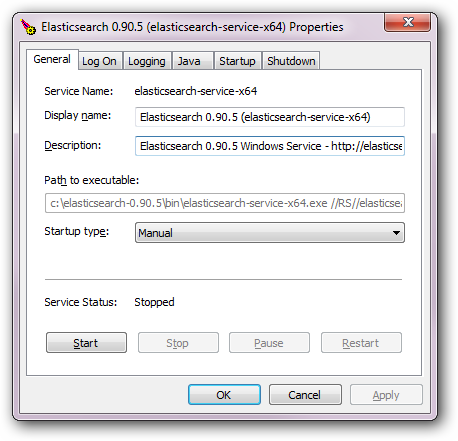 Windows users can configure Elasticsearch to run as a service to run in the background or start automatically at startup without any user interaction. This can be achieved through service.bat script under bin/ folder which allows one to install, remove, manage or configure the service and potentially start and stop the service, all from the command-line. The script requires one parameter (the command to execute) followed by an optional one indicating the service id (useful when installing multiple Elasticsearch services). Note that the environment configuration options available during the installation are copied and will be used during the service lifecycle. This means any changes made to them after the installation will not be picked up unless the service is reinstalled. The service 'elasticsearch-service-x64' has been installed. While a JRE can be used for the Elasticsearch service, due to its use of a client VM (as oppose to a server JVM which offers better performance for long-running applications) its usage is discouraged and a warning will be issued. at its core, service.bat relies on Apache Commons Daemon project to install the services. For full flexibility such as customizing the user under which the service runs, one can modify the installation parameters to tweak all the parameters accordingly. Do note that this requires reinstalling the service for the new settings to be applied. There is also a community supported customizable MSI installer available: https://github.com/salyh/elasticsearch-msi-installer (by Hendrik Saly).